This kind of scale is an economical and portable platform scale for daily use. Once the platform has been assembled, products can be easily weighed. The scale is light and it can be powered by the mains adapter or by batteries which make this scale very mobile. Due to this fact platform scale can be placed everywhere. We offer you an excellent quality at an affordable price. At this link, you will find an overview of all our scales and balances. 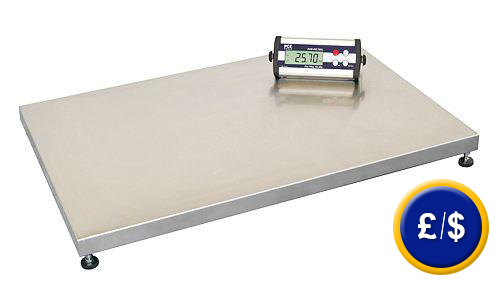 If you need a verifiable platform scale, we recommend you platform scale of PCE-PS 150MXL series. More information about this platform scale as well as about other scales with similar functions can be found at this link. Platform scale PCE-PS 75 XL display provided with an internal accumulator. Mains adapter 230 V/50 Hz or powered by batteries or by means of an internal accumulator. 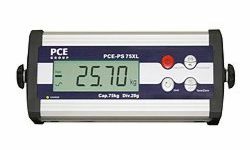 1 x PCE-PS 75XL platform scale, 1 x display connected to 2 m cable, 1 x mains component and user manual. The kit includes a software for transferring the weighing data to a PC or Portable and RS-232 cable. When you press a key, weighing data is automatically sent to a computer. The transferred data can also be sent to other software as Excel. It is RS-232 adapter to USB. Many computers come only with USB interface, so the USB-RS-232 adapter is required. In order to meet ISO 9000 standard, platform scale is sent to an authorized laboratory. Your scale will be tested and if there is a need, it will be adjusted. Serial number and customer's name and address are included.